Every September 25, the New York state will celebrate ‘Bangladeshi Immigrant Day,' starting from this year. 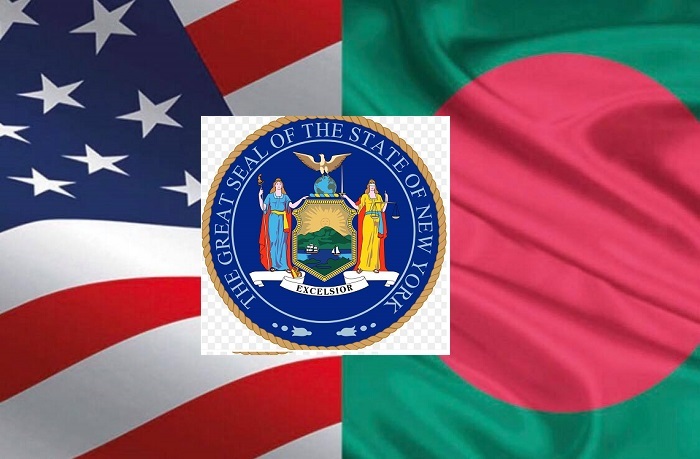 Last February 27, a Senate bill ‘Bangladeshi Immigrant Day,' initiated by New York state senator Stavisky passed unanimously by the legislative body of the New York state. The New York state senate resolution number 322 states, this legislative body is justly proud to memorialize Governor Andrew M. Cuomo to proclaim September 25, 2019, as Bangladeshi Immigrant Day in the State of New York, in conjunction with the observance of the 4th Bangladeshi Immigrant Day Global Convention 2019. Bangladeshi immigrants began arriving in the United States in the late 19th Century, leaving behind the hard economic and political times of the still-developing Bangladesh, which achieved independence from Pakistan in 1971. During this time, the largest groups of Bangladeshi immigrants arrived in New York City, where many worked at the ports on various ship docks. Hailing mostly from Dhaka, Chittagong, Sylhet and Noakhali regions, more than 10,000 Bangladeshis immigrate to the United States annually. As of 2014, the total number of Bangladeshi immigrants in the United States was approximately 500,000, with more than half residing in New York, according to the Senate resolution. The Senate resolution also mentioned how, for two decades, the Muktadhara Foundation, a New York-based organization dedicated to the promotion of Bengali culture, has celebrated its history and literature by hosting the Bangla Festival and Book Fair. The CEO and founder of the Muktadhara Foundation, Bishawjit Saha states that on the September 25th, in 1974, our nation's father Bangabandhu Sheikh Mujibur Rahman gave his first speech at the United Nation's General Assembly (UNGA). That is why this date is very significant for our us as a nation. In 2021, our nation’s father Bangabandhu Sheikh Mujibur Rahman will be 100 years old. Getting this bill passed before he turned 100 years old and celebrating ‘Bangladeshi Immigrant Day’ on every September 25 will be a great way to respect and honor his memories. Bishawjit Saha further states that the New York state senate resolution number 322 was sent to the Muktadhara Foundation on March 12. On March 17, this resolution will be presented at the Young People’s Festival in Queens, New York. To celebrate our nation’s father Bangabandhu Sheikh Mujibur Rahman birthday, the Muktadhara Foundation has been hosting this event for last three years.